A landscape installation is the process of adding or subtracting features to your yard / landscape. This process can be time consuming and cost a quite a bit money depending on you project. Many times, home owners are not sure what to do and even how to get started. Grapevine Lawn Guys would be smart choice to work on your landscape projects. Increasing the value of your home. Homes that have well-manicured lawns, trimmed bushes and trees, in addition to clean garden beds add significant value. Improving your home’s curb appeal – Be the talk of the neighborhood with a beautiful landscaped yard. Preventing soil erosion around your yard and home. Slopes and inclines will draw water and soil away from your home. This might cause foundation issues or lead to faster nutrient deficiencies. 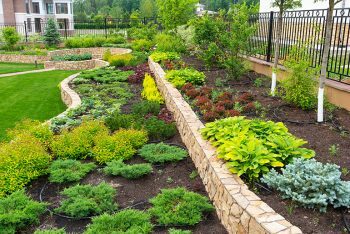 There are basics principles to landscaping. These two parts are Softscape and Hardscape. The ideal landscape is a balance of both hardscape and softscape. Hardscaping refers to the solid, hard elements in landscape design. Elements that stay in place for many years. For examples of hardscape are rocks and boulders, walkways, retaining walls, paver patios, outdoor kitchens, water features, decks and driveways. Softscaping is the opposite of hardscaping. Softscapes doesn’t have that long-term or permanent quality. Softscaping is the living part of a landscape. Softscape consist of elements such as soil, plants, shrubs, trees, flowers, vegetables, vines, grass and changing colors. Xeriscaping is the philosophy that focuses on drought tolerant and water saving plants and landscaping principles. Elevated garden beds planted in a retaining wall, or wooden border. A pergola or trellis with flowering vines and flowers decorating the sides. A stone pathway with accents of flowers and ornamental grass. Grass installation and Fertilizing. New sod and annual fertilization to keep your lawn looking great. Garden and flower bed preparation. We dig up old grass, turn the soil, create the beds, and add amendments if needed. Planting your annuals and perennials, shrubs, and trees. New planting / installations usually take place in the spring, early summer, or fall. Ground cover that include mulch, gravel, river rocks and plants ground cover. Water features that include pond less waterfalls, and fountains. French drains and rain gardens. Sprinkler systems and Irrigation systems such as drip lines and soaker hoses. Hardscaping features, such as firepits, decks and outdoor kitchens. Planning and designing your landscape is the start of a wonderful transformation. Grapevine Lawn Guys will help plan and design the features you wish to install. At the beginning of your project, please let us know if you prefer organic products and practices used in your installation. We use organic and man-made chemical fertilizers. Before garden work can begin, Grapevine Lawn Guys will test the existing soil, and if necessary will treat the soil with soil amendments. These amendments includes compost, expanded shale, and sand to improve nutrient content, improve drainage, and overall soil condition. The work itself can be labor intensive and time consuming. The job will be completed in a timely manner with quality workmanship and service. With several years’ experience working on landscaping projects and yard renovations, Grapevine Lawn Guys is the best choice for you. If your landscaping project has to be completed by a specific date, to coincide with a special event such as a parties, weddings or graduation celebration. Please let us know no later than two to three months in advance. Cleaning up and following through with quality checks on any landscaping installation is the last step in the process. We don’t leave behind any materials and will guarantee customer satisfaction.